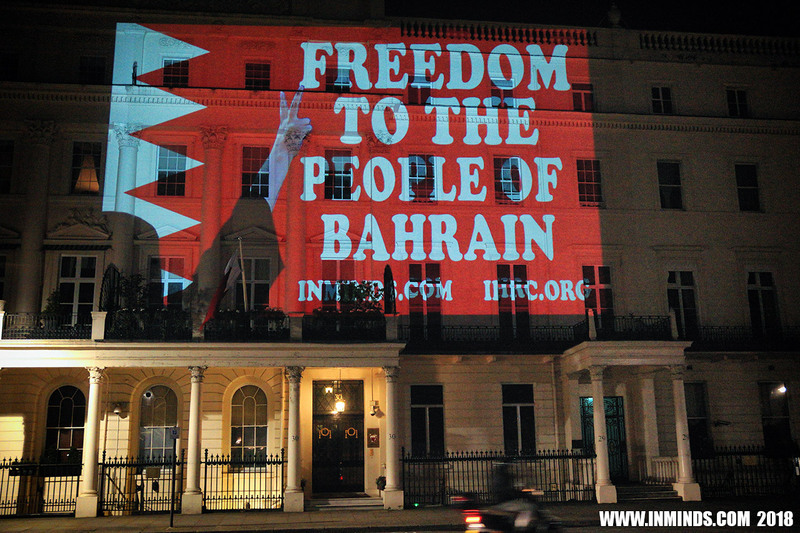 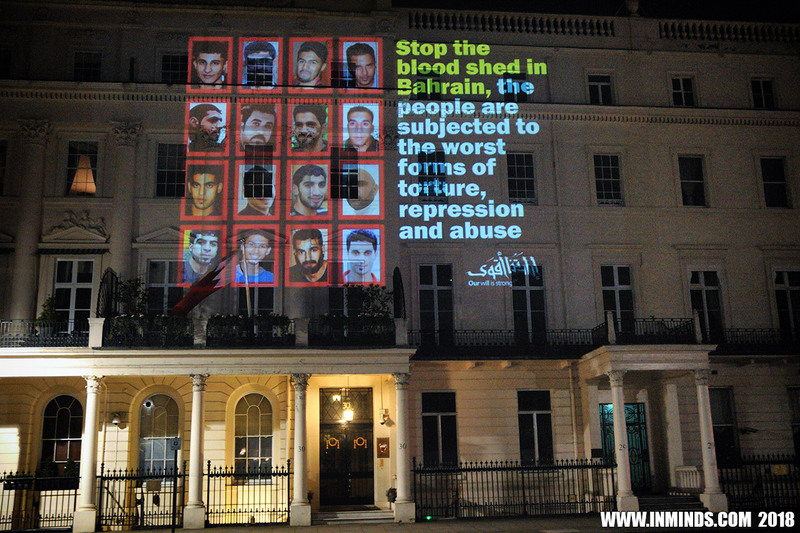 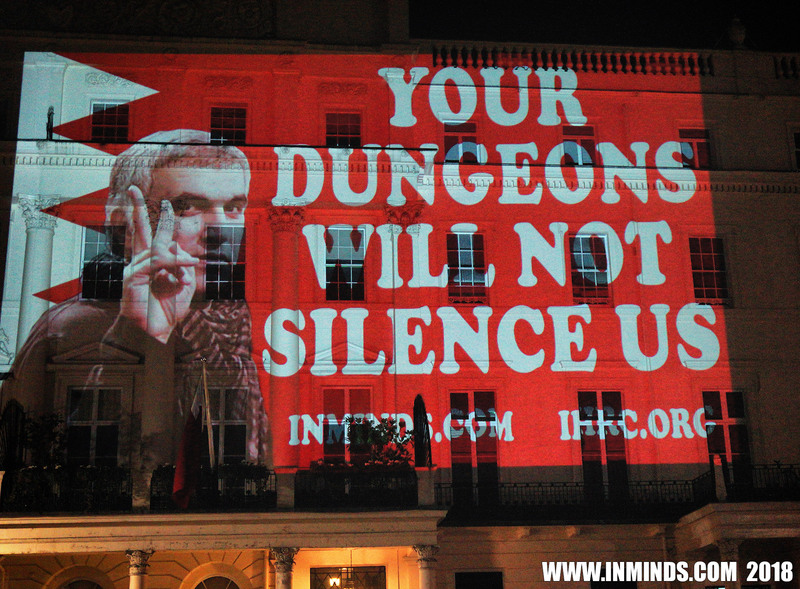 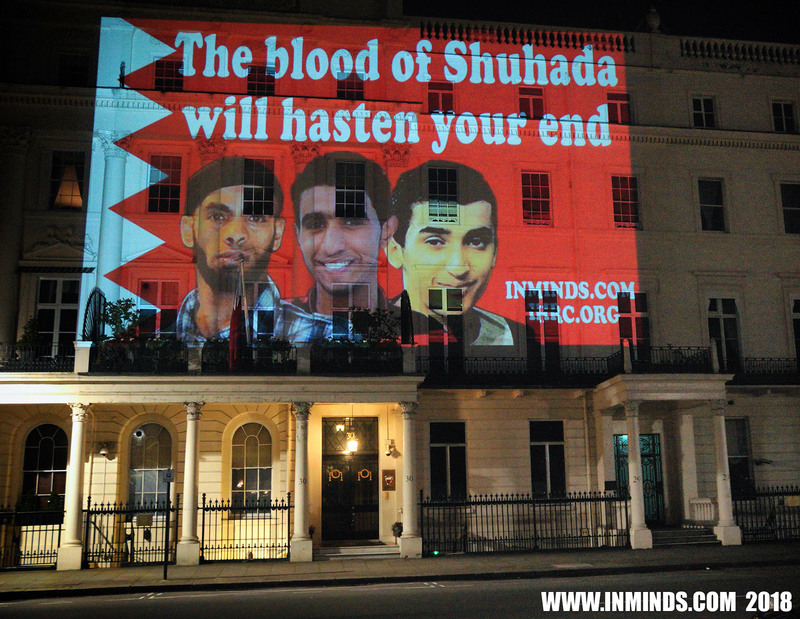 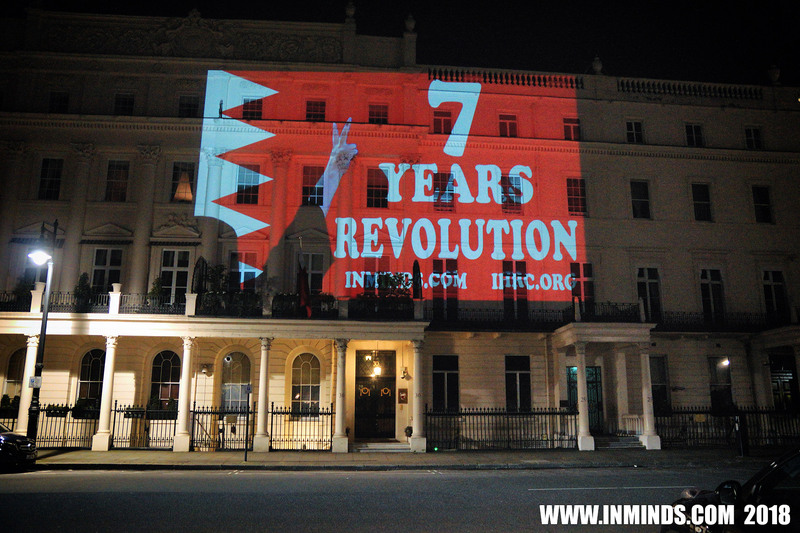 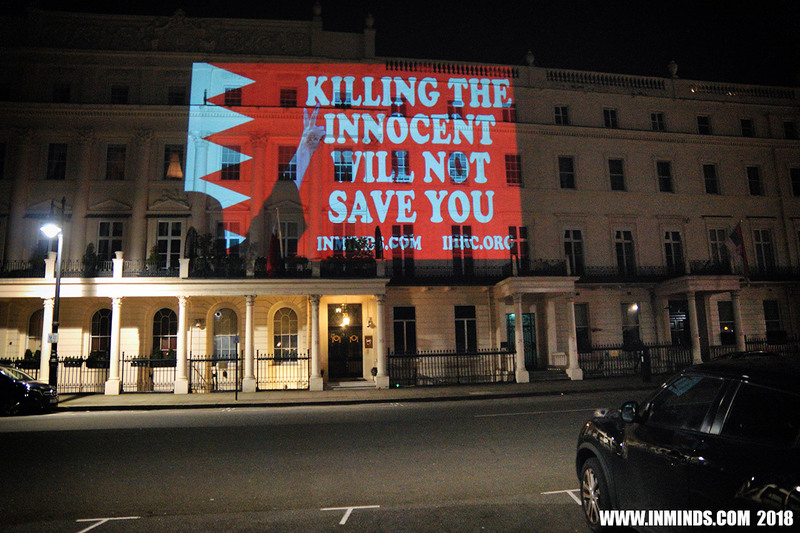 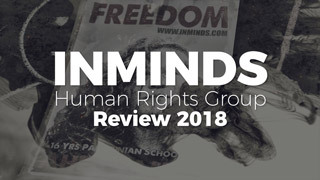 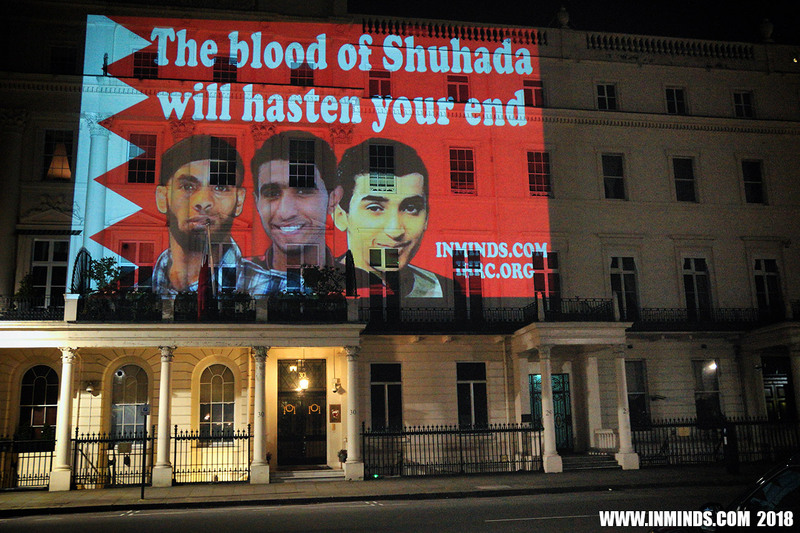 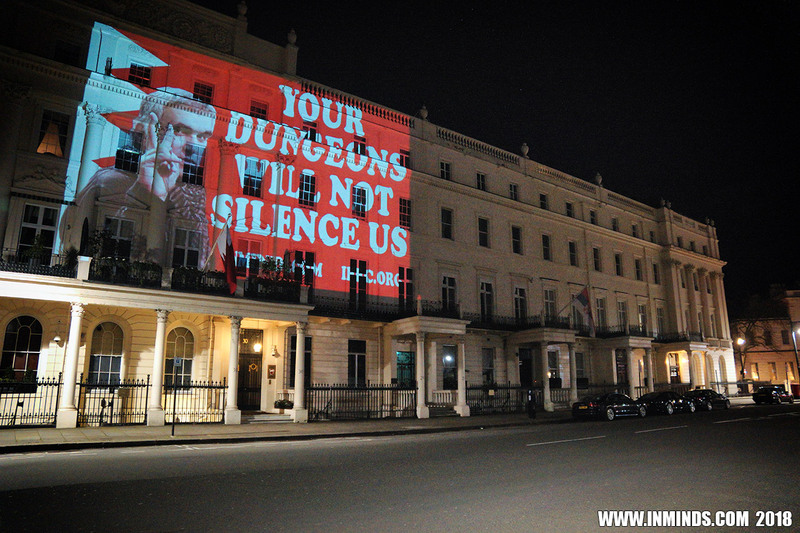 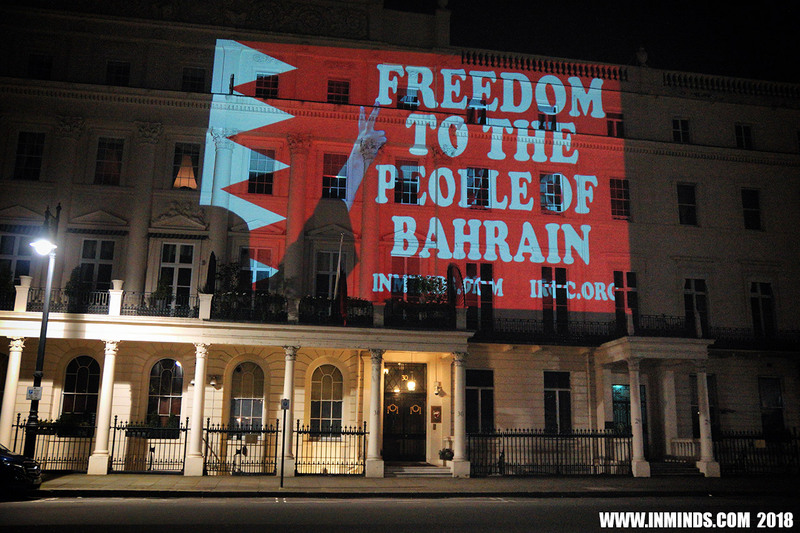 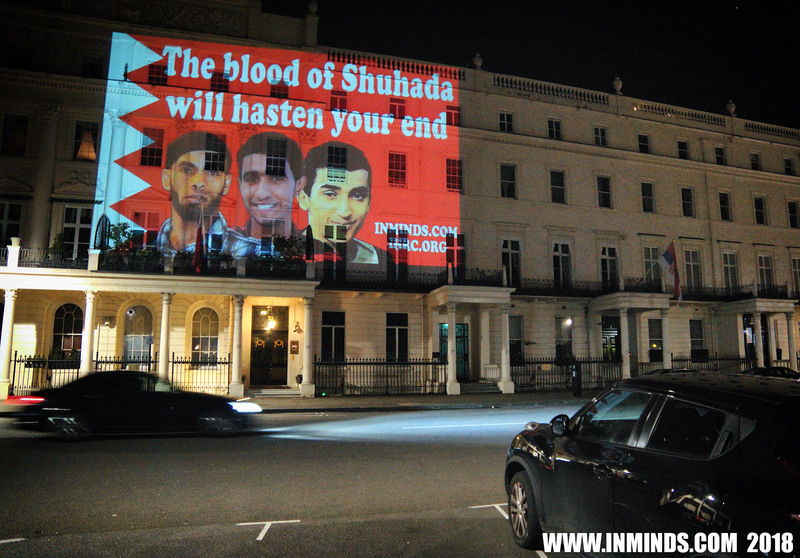 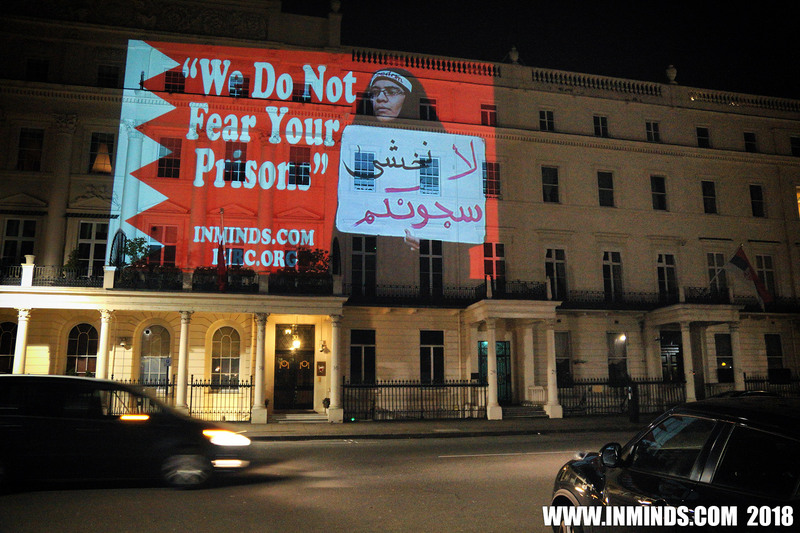 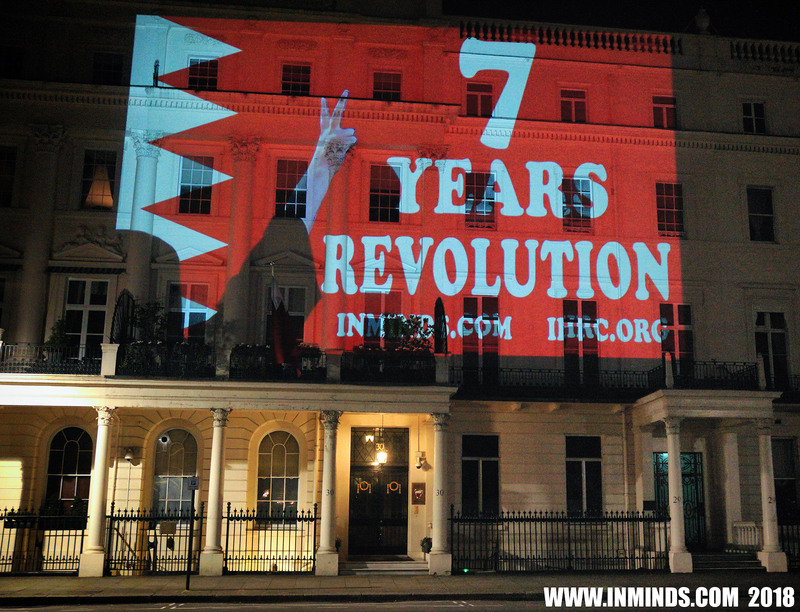 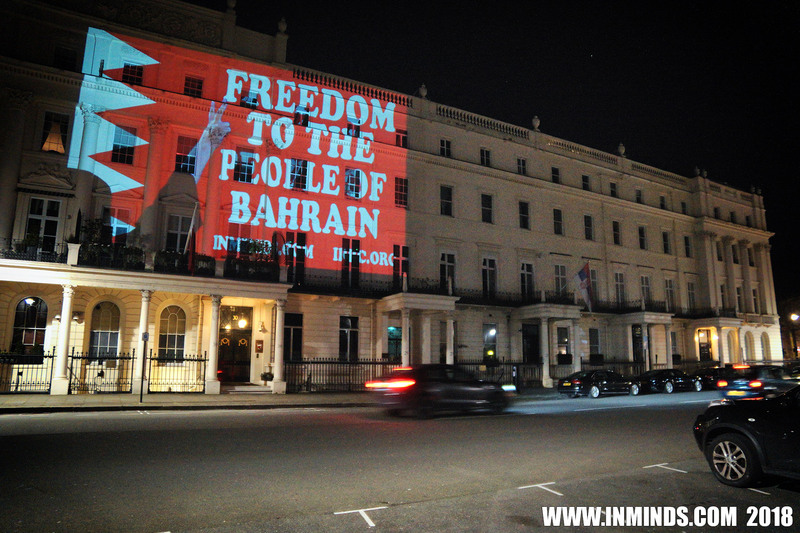 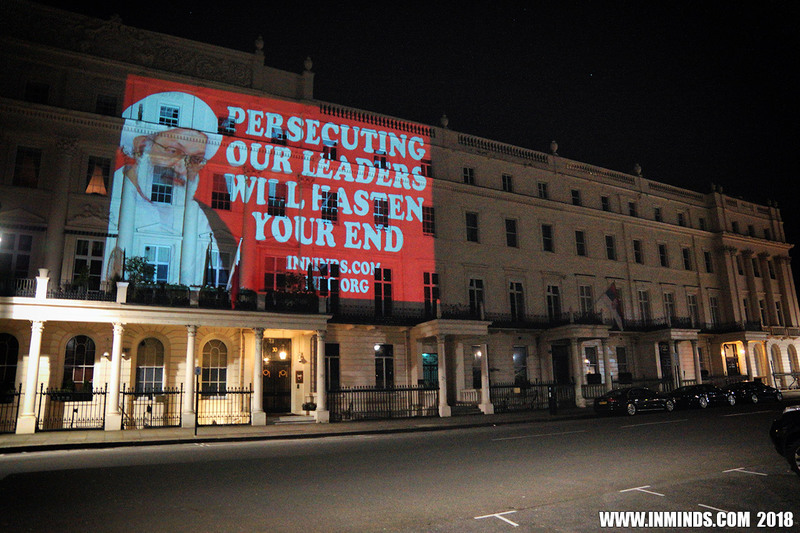 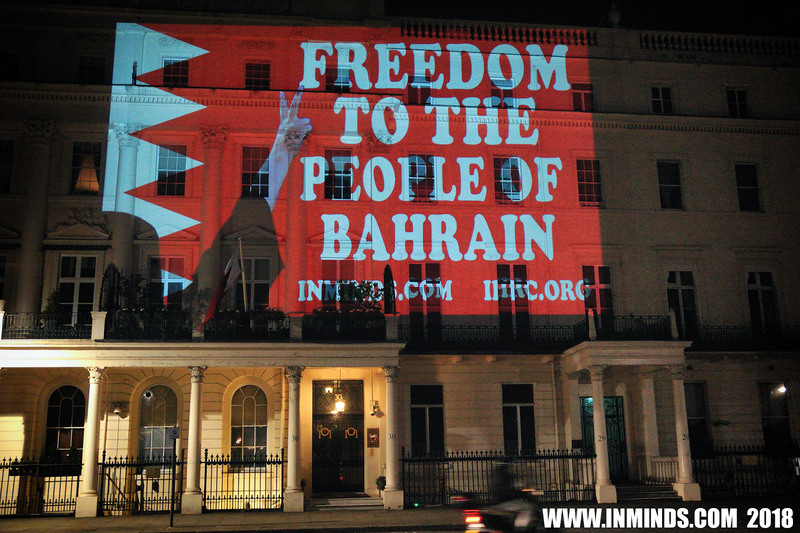 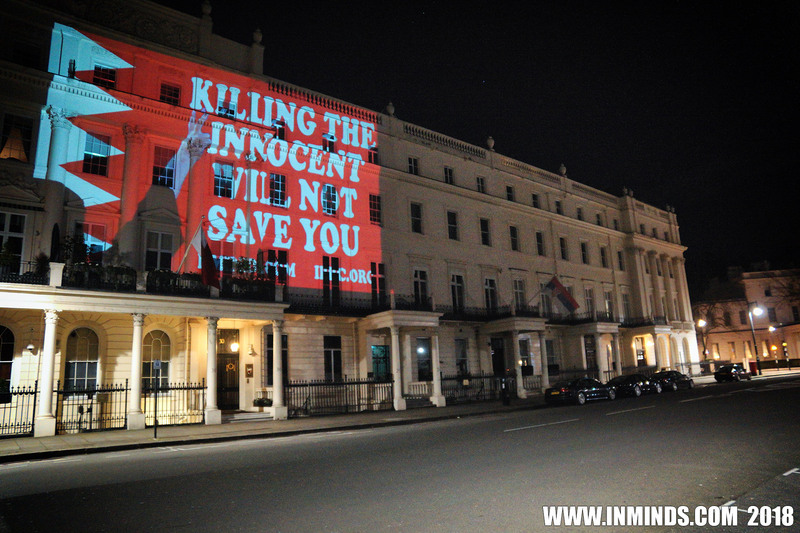 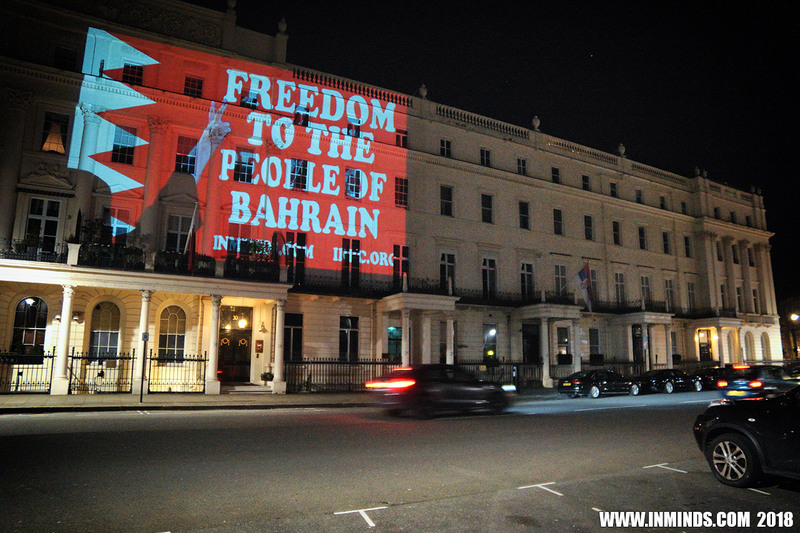 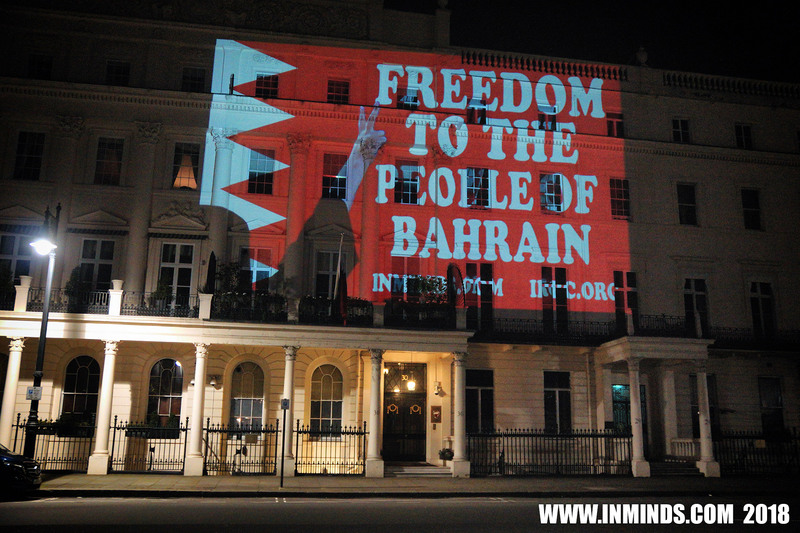 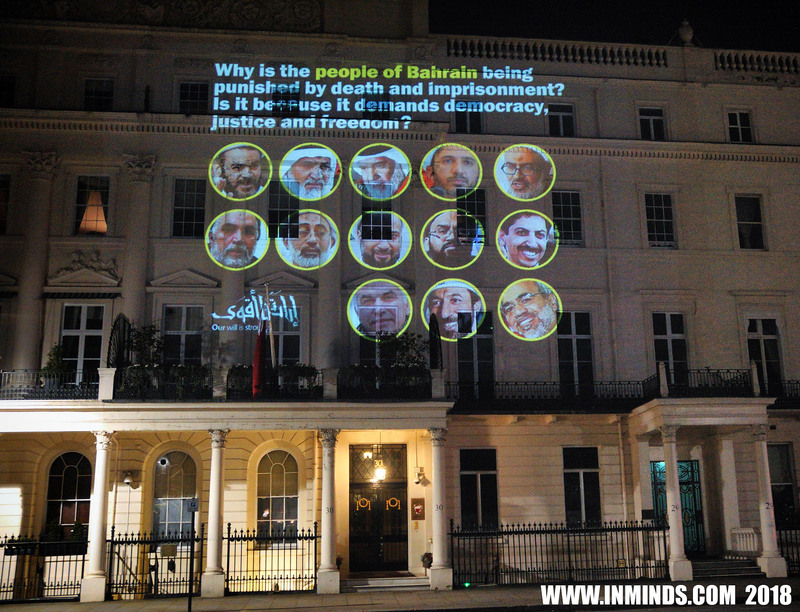 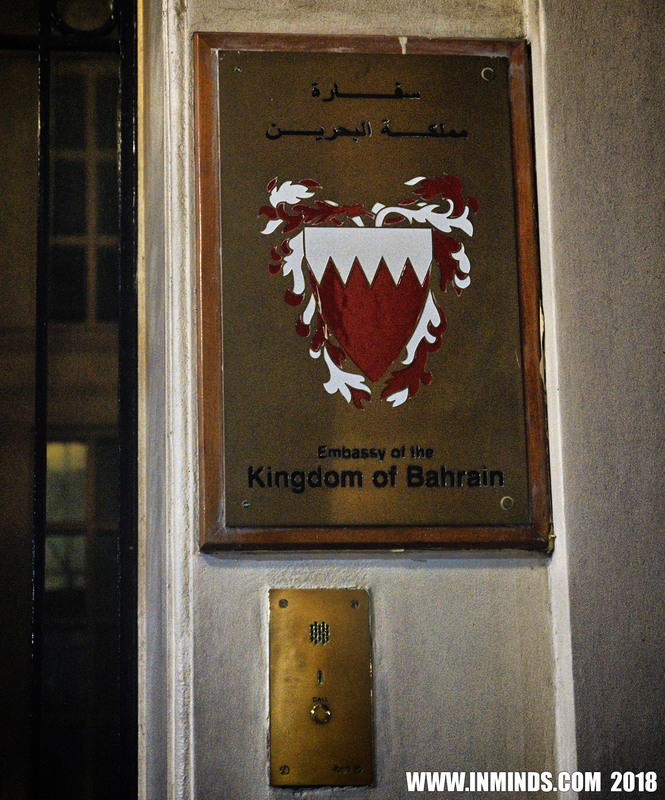 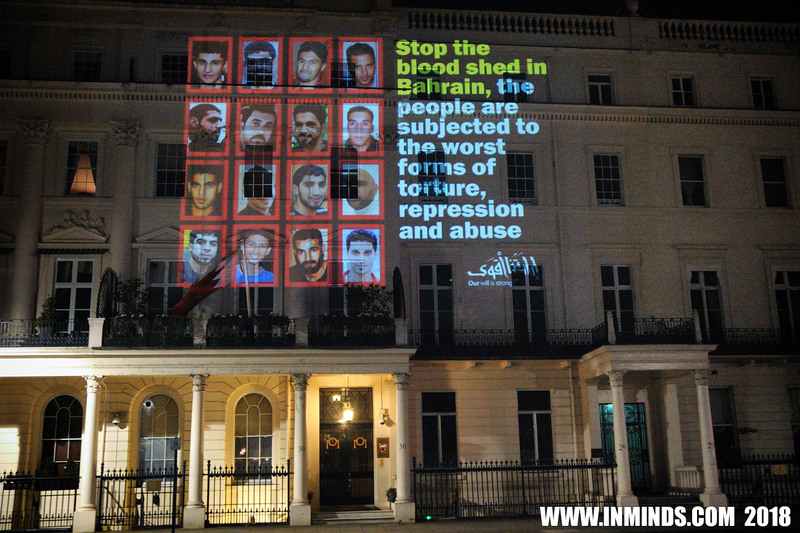 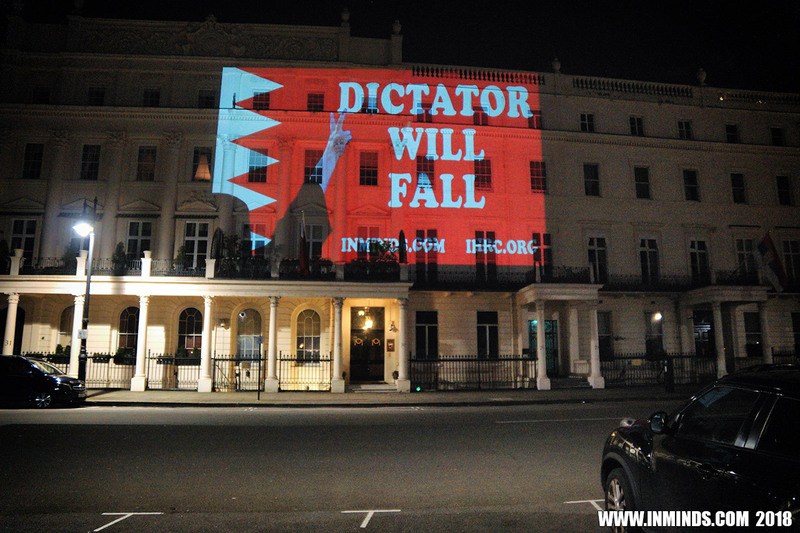 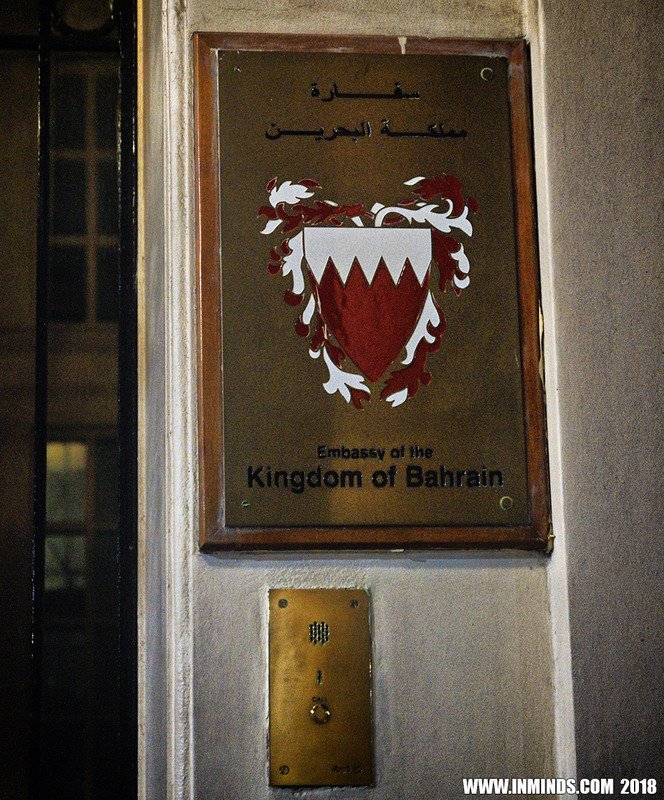 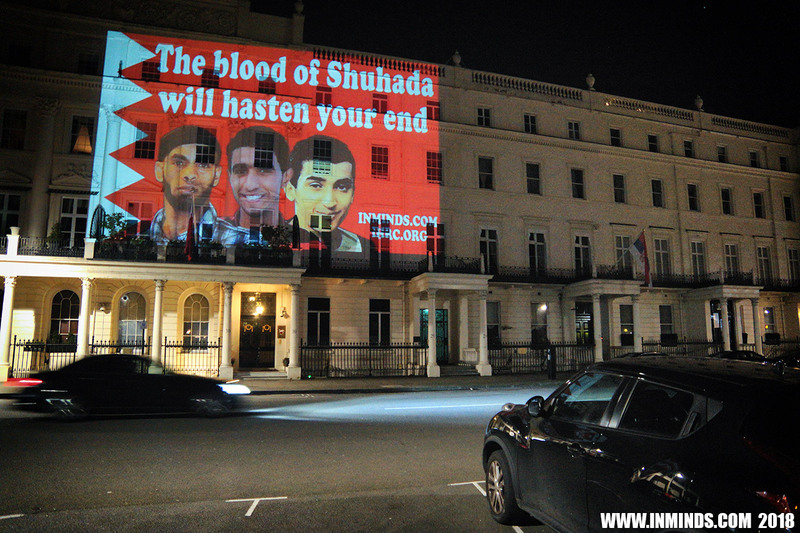 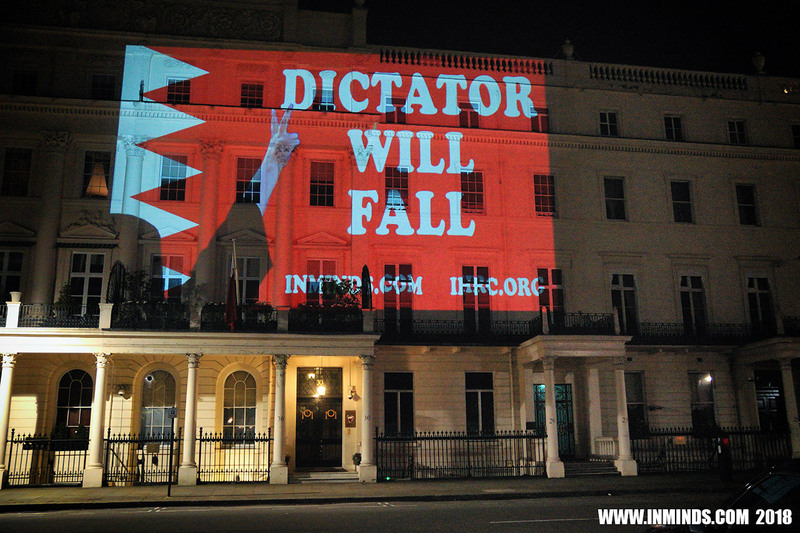 To mark the 7th anniversary of the uprising of the Bahraini people against the brutal Khalifa dictatorship, Inminds human rights group along with the Islamic Human Rights Commission held a guerilla projection on the walls of the Bahraini Embassy in London on 11th February 2018. 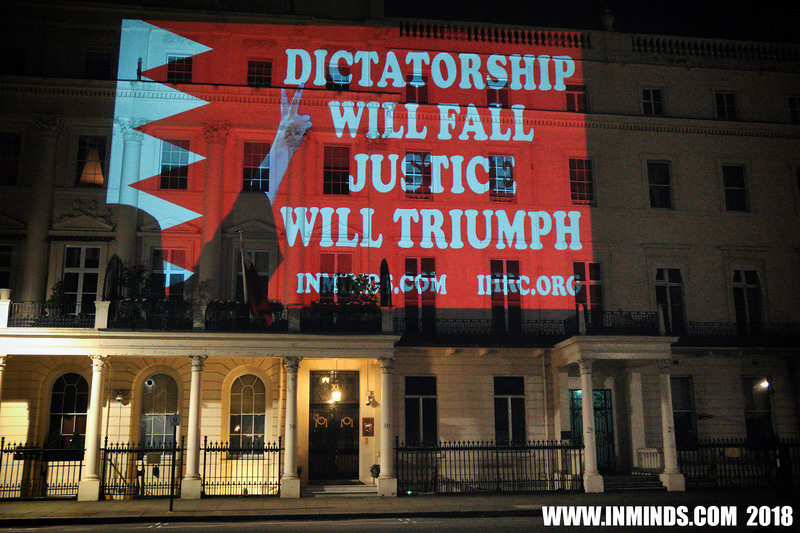 Inminds chair Abbas Ali said "We are here to call for the end of the Khalifa dictatorship and freedom for the people of Bahrain. 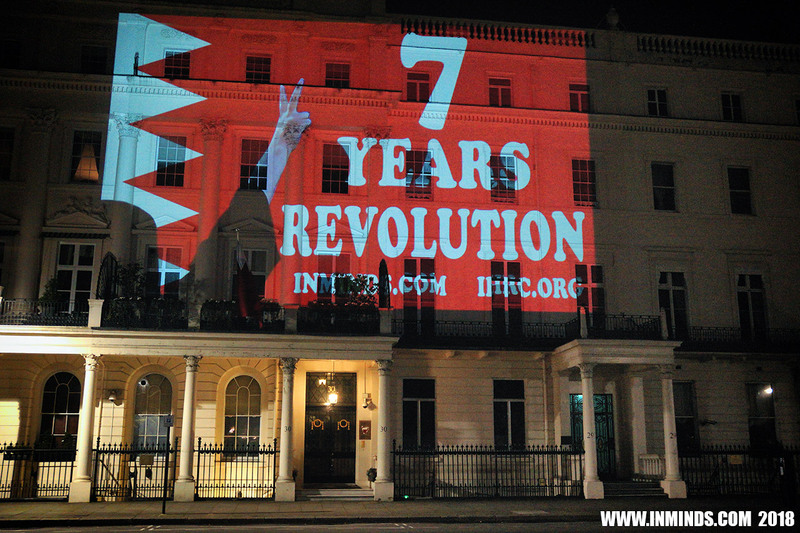 The revolution is in its seventh year. It has endured seven years of brutal suppression. 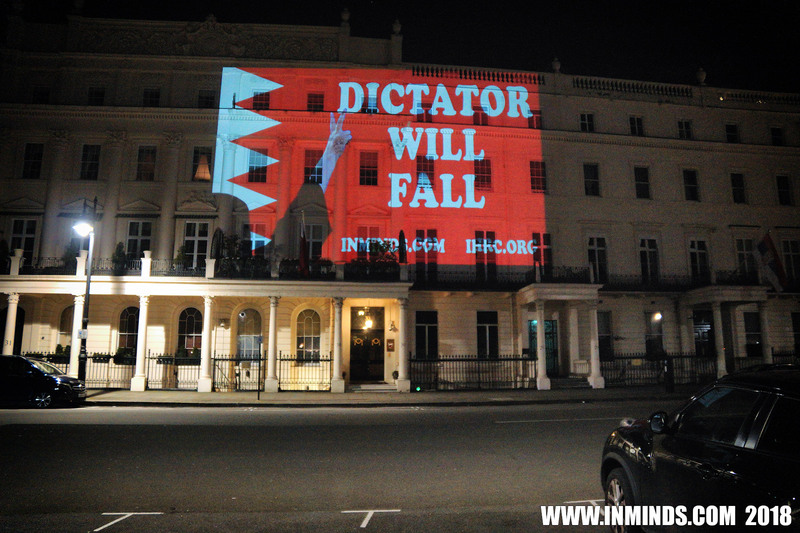 Troops from Saudi Arabia, UAE and Jordan have invaded the tiny island to try and prop up the dictatorship. 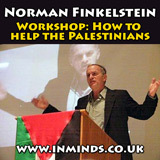 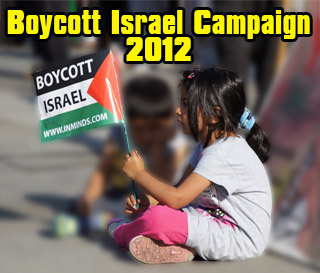 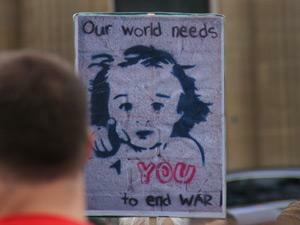 The British government has shamefully provided over £51 million worth of arms to the dictatorship since the uprising to help crush it, it has also provided training by the elite Lima Company of 42 Commando Royal Marines to the regimes troops who indiscriminately kill Bahrainis, including children as young as 6 years old, and it also trains the regimes police force which the regimes own inquiry admits tortures people. 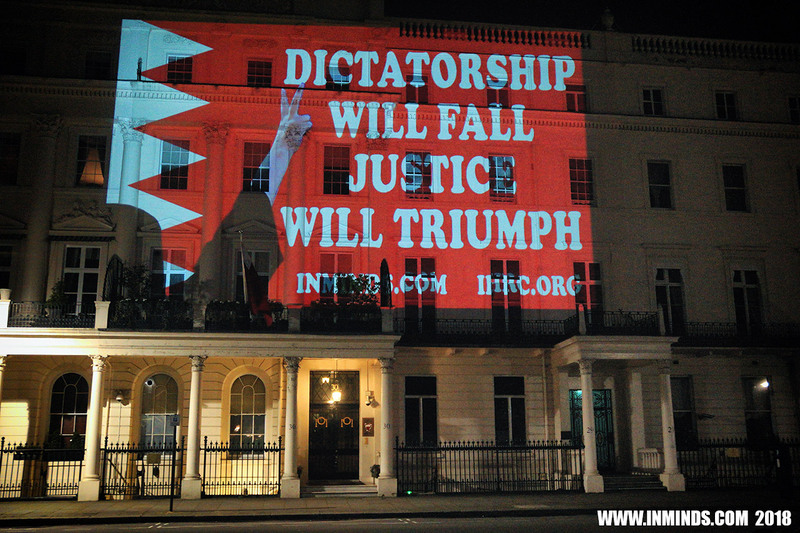 Yet despite all this support, the regime is floundering and the revolution is strengthening every day. 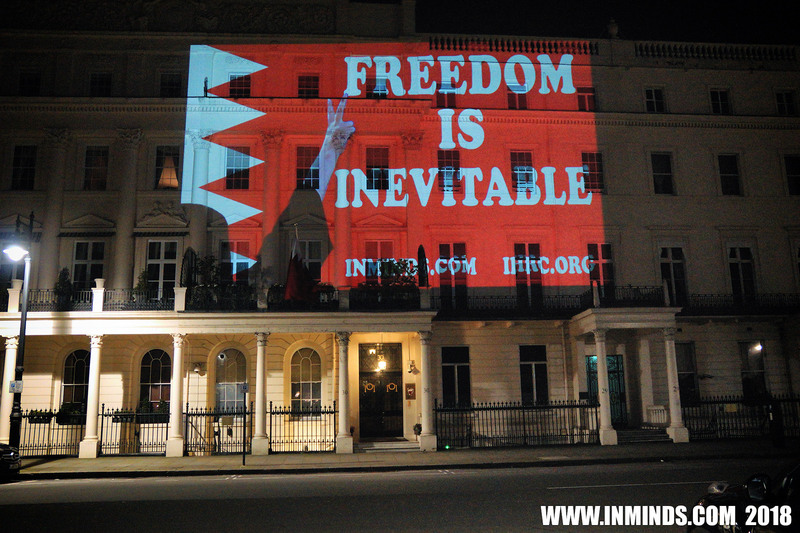 Victory is inevitable, but its our duty to lessen the cost of that victory on the Bahraini people by pressuring our government to end its support for this vile regime." 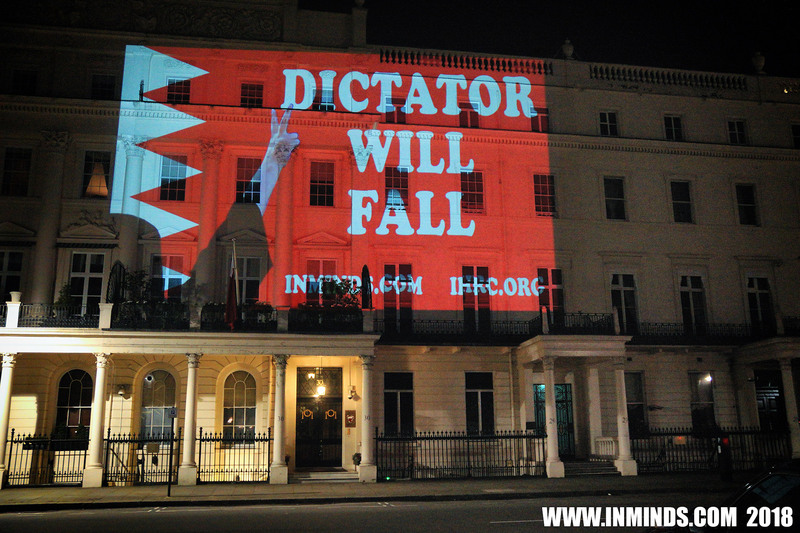 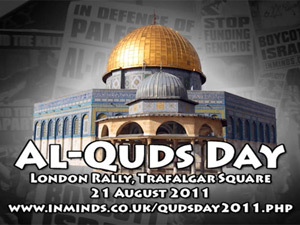 The projection called for the fall of the Khalifa dictatorship and freedom for the people of Bahrain. 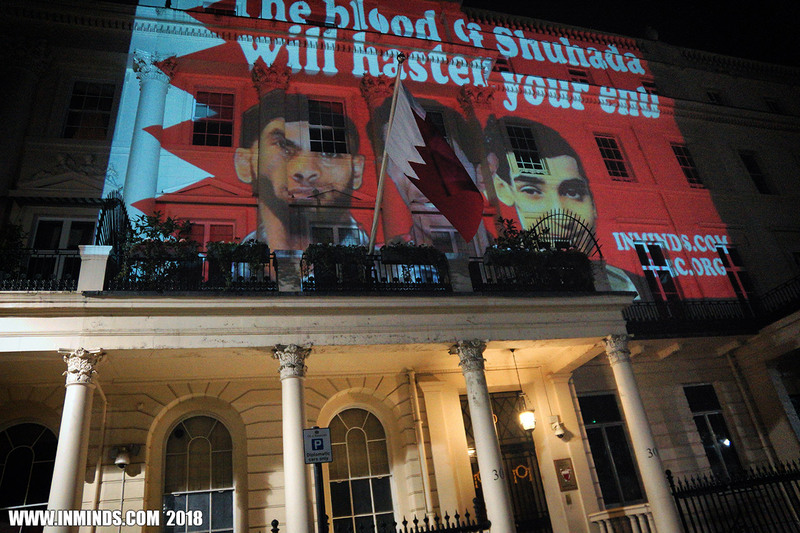 It highlighted the plight of the Bahraini people - the torture of women activists like Ebtisam al-Sayegh, the imprisonment of human rights defenders like Nabeel Rajab and Abdulhadi Al-Khawaja, and the extrajudicial murder of the youth like Sami Mushaima, Abbas Jamil Tahir al-Sami’ and Ali Abdulshahid al-Singace who were executed one year ago on Jan 15th 2017 after enduring 3 weeks of barbaric torture. 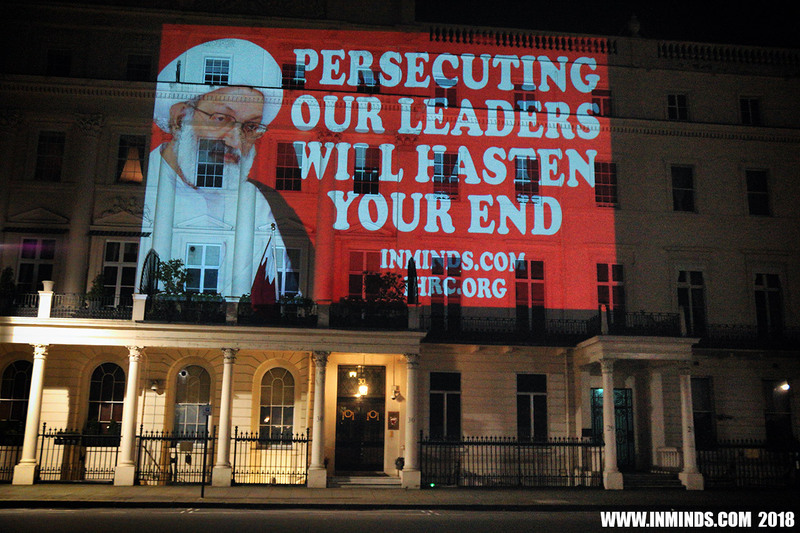 The projection also touched on the sectarian persecution of the community by the Khalifa dictatorship, including persecution of its leaders like Ayatullah Sheikh Isa Ahmed Qassim. Over 50 mosques have been destroyed by the Khalifa dictatorship in 2011 as part of their repression of Bahrain's Shia majority. 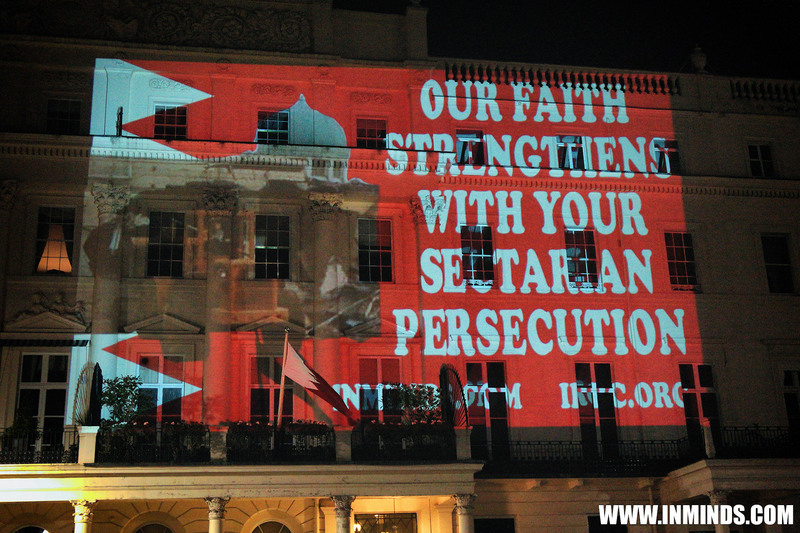 This includes the 400-year-old Sheikh Mohammed Barbaghi mosque in Aali, an image of its destruction was projected with the words 'Our Faith Strengthens With Your Sectarian Persecution'. 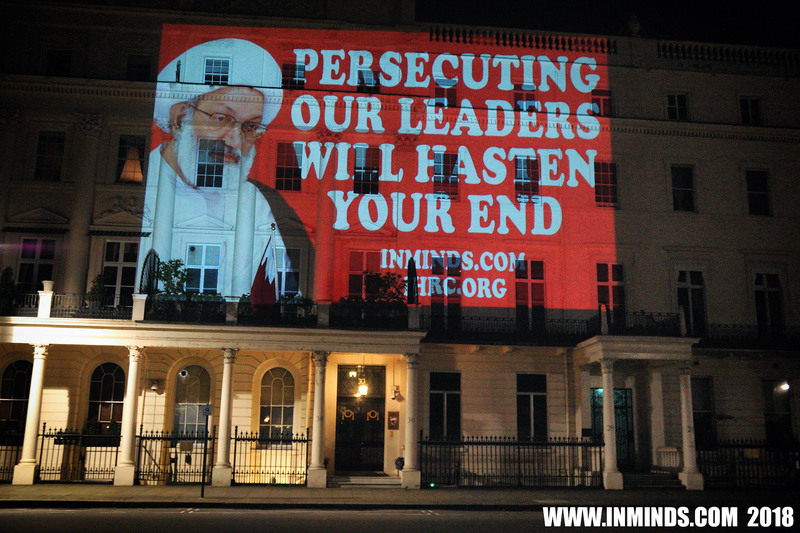 Bahrain's leading Shia Muslim scholar Sheikh Isa Ahmed Qassim's nationality was stripped and he was put under house arrest due to his opposition to the invasion by Saudi/GCC troops of Bahrain which he said he "would have been proud" if instead they went "to help our brothers in Gaza". 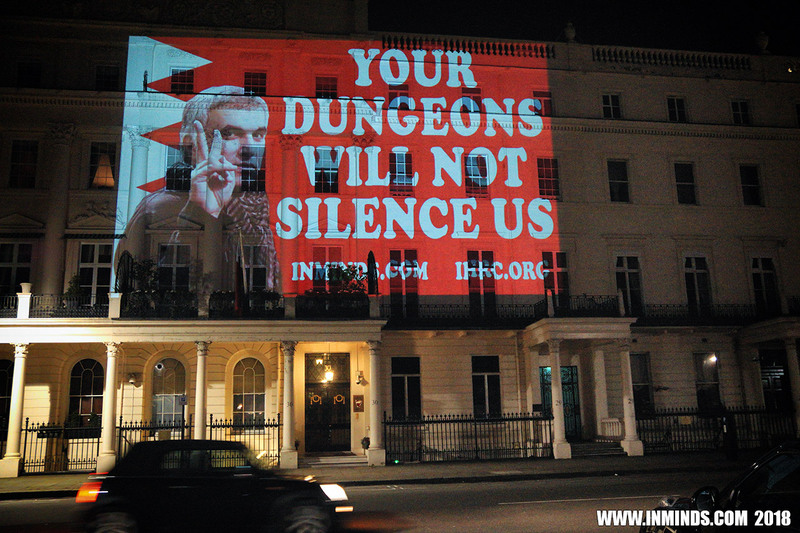 As his health deteriorates, he has now been sentences to jail for one year. 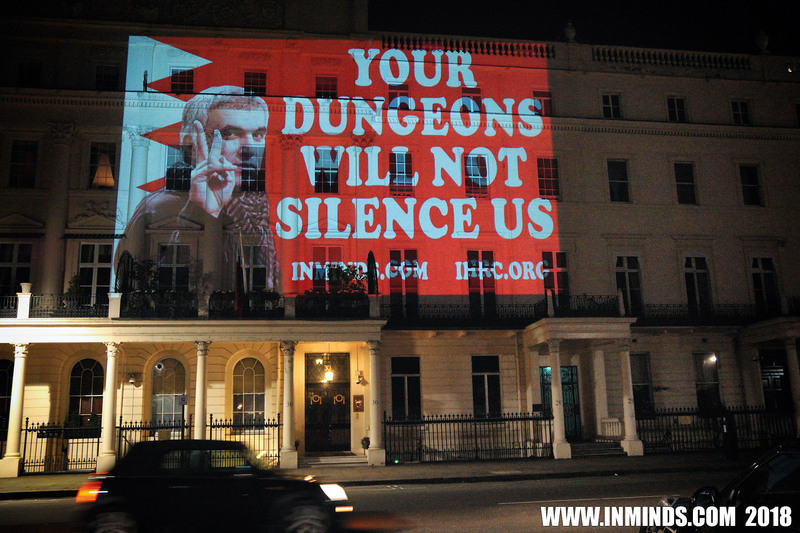 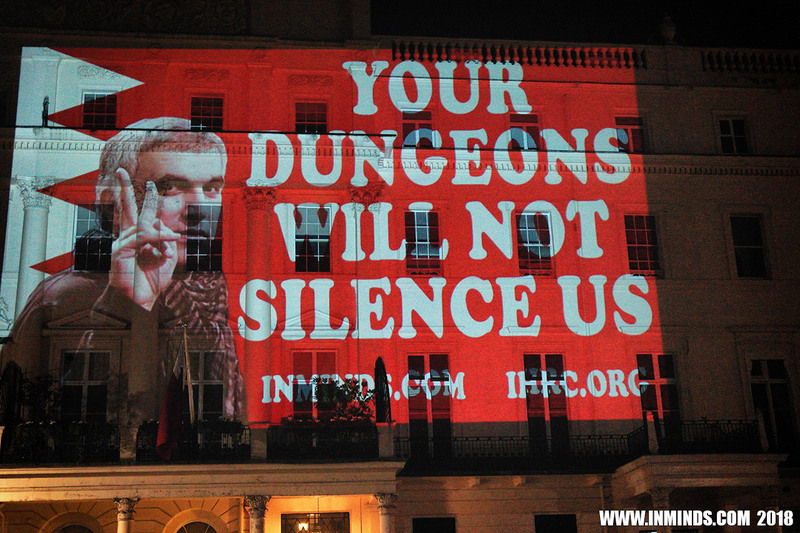 Human rights defender Nabeel Rajab has been held in solitary confinement for over 9 months. 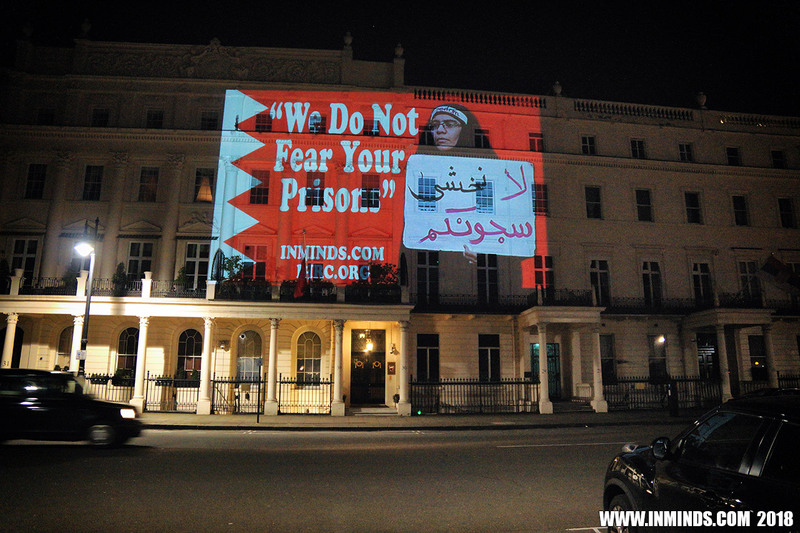 He is already serving a 2 year sentence for interviews and articles that have been published in the New York Times and Le Monde, and faces further charges with a possible sentence of 15 years simply for tweeting about the Saudi war on Yemen and torture at Bahrain's infamous Jau prison. 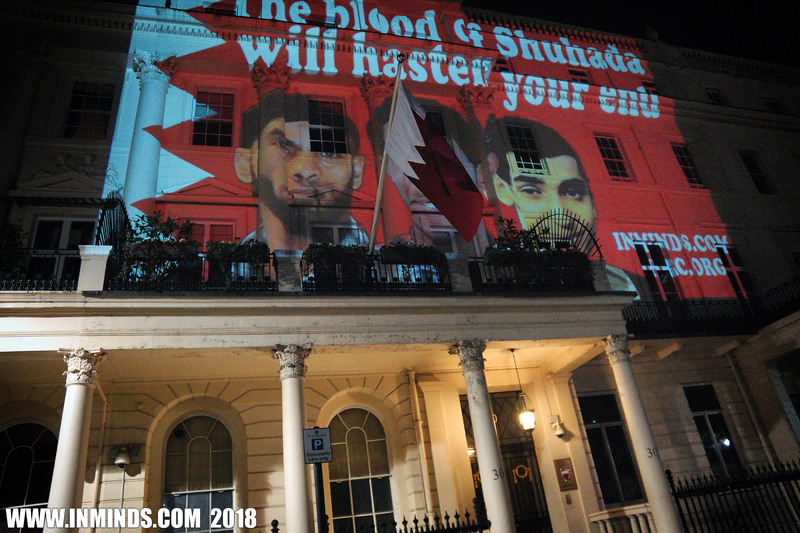 Final sentencing for this charge is expected next week, on 21st Feb 2018. 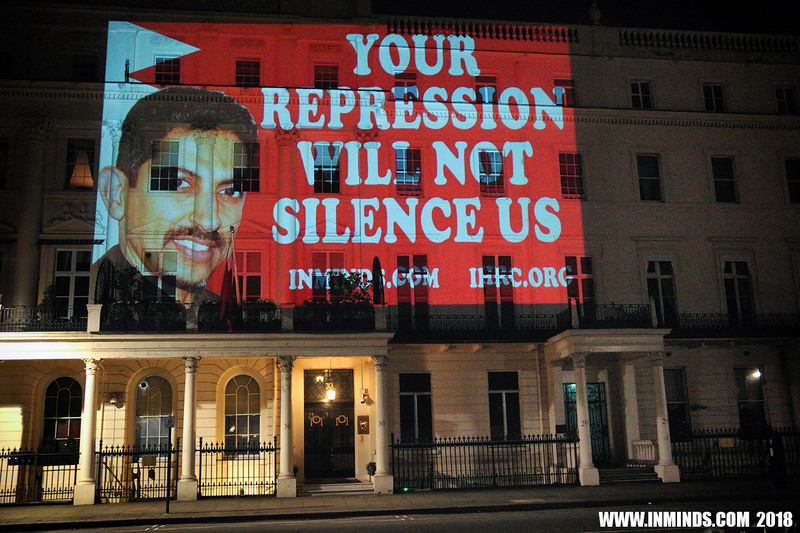 Human rights defender Abdulhadi Al-Khawaja is serving a life sentence for his human rights work. 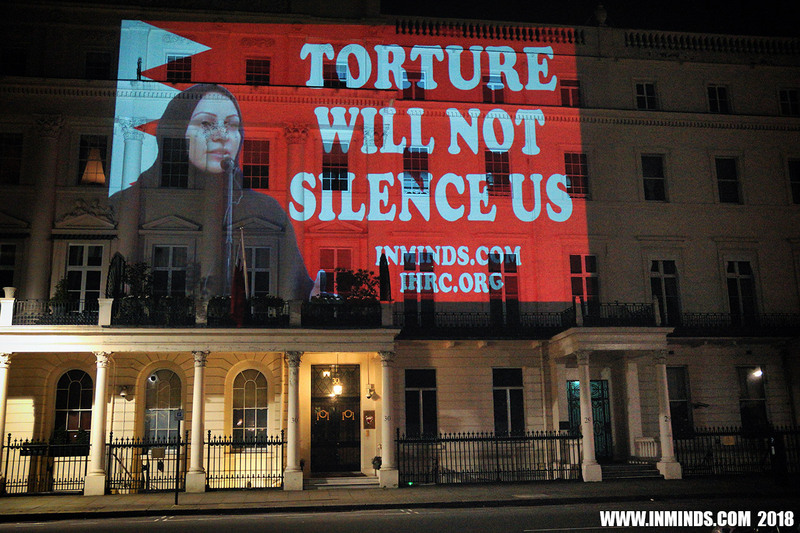 He was subjected to torture and inhuman treatment during his arrest and detention . 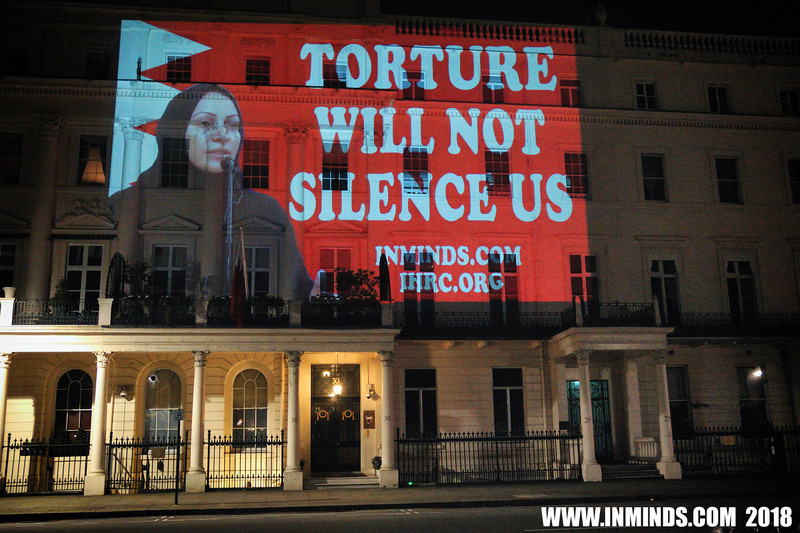 He was brutally beaten, resulting in a broken jaw, and later spent months in solitary confinement where he was subjected to severe acts of torture. 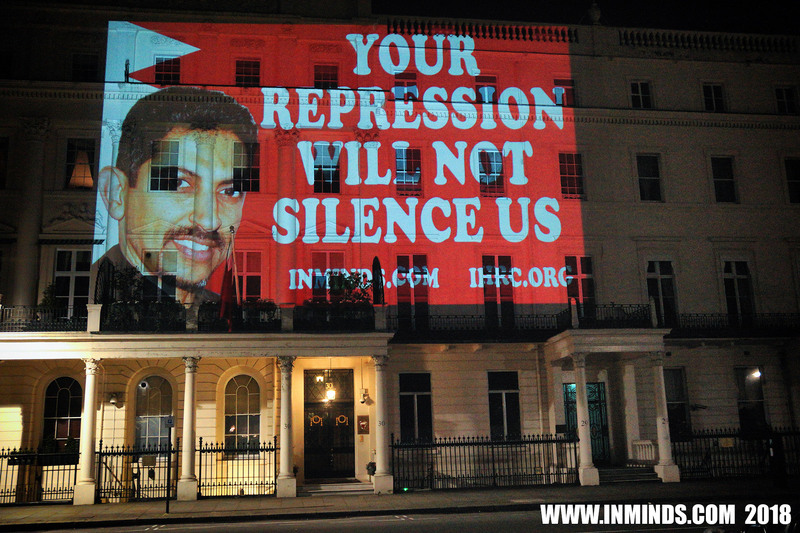 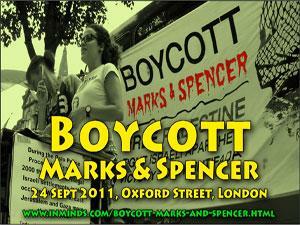 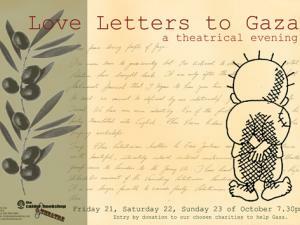 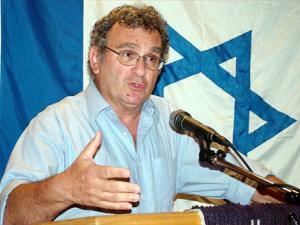 He has launched several hunger strikes to protest his arbitrary detention. Both his daughters Maryam and Zainab Al-Kawaja, prominent human rights defenders in their own right, have also been imprisoned in the past. 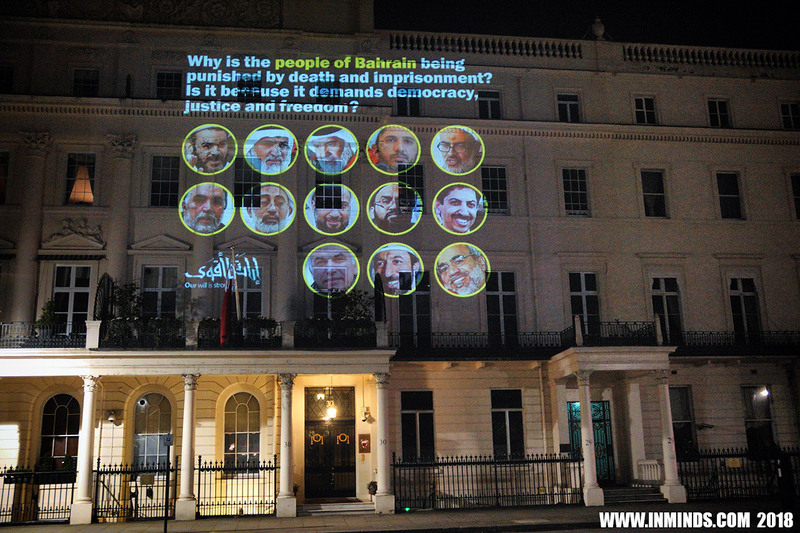 A comic strip was made from photos of street theatre performed at the Inminds vigil yesterday outside the Bahrain embassy in London to tell the story of UK complicity in the suffering of the Bahraini people at the hands of the al Khalifa dictatorship. 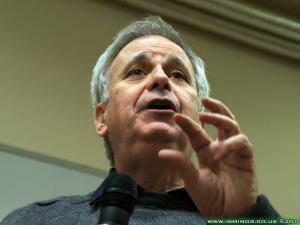 "What they did last night was more important than 10,000 peace conferences - they just blew up the wall!"